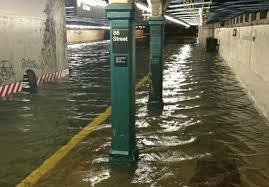 Subway stop after Sandy, October 29, 2013. Robert Trentlyon has been keeping his friends informed about rising water levels and what they might mean for New York City. Here are two responses to the problem that have appeared recently. My thanks to him for sending them to me. New York City plans to be flooded. Unlike people living in several cities in Europe and New England who are protected from coastal flooding with storm surge barriers, New Yorkers are promised only “resilience,” the ability to withstand and recover. Because New Yorkers are tough. So says Mayor Bloomberg’s new plan for the city, A Stronger, More Resilient New York. Storm surge, a gradual rise in sea level over a few hours or days, is identified in the Mayor’s plan as the most severe threat from climate change, worsening by the 1950s as sea level rises and hurricanes become more severe. Two or three storm surge barriers that would be closed to block the entrances to New York Harbor when a storm surge approached would protect the entire inner city as well as nearby New Jersey and the Hudson Valley, places that are blank areas on the City’s flood maps. Instead, the Mayor’s plan calls for a patchwork of local measures to protect the most vulnerable areas in the inner city, including Red Hook in Brooklyn, Southern Manhattan, the lower East Side, East Harlem and Hunts Point in the Bronx. These would be guarded not with conventional seawalls or levees but with a novel “integrated flood protection system.” Exactly what that means would be determined by a global design competition. What the planners seem not to have noticed is the findings of the Interagency Performance Evaluation Task Force (IPET), a monumental study of the lessons of Hurricane Katrina in New Orleans in 2005. Where the floodwalls failed in New Orleans was at their ends, either at the junction with another type of structure or adjacent land. Thus, these fragmented protection measures in the City may well be outflanked by flood waters, and they almost guarantee that nearby neighborhoods would suffer worse flooding. Resilience would otherwise be provided by individual owners of buildings or homes who would be expected to move their utilities and furnaces out of the basement into upper floors, or in some cases to raise their entire houses above the expected flood level. Whatever the merits of some of these local plans for interim protection, the City needs long-term protection as the threat of coastal flooding worsens, a concept that seems missing from the Mayor’s plan. Why not storm surge barriers? One of the 445 pages of the Mayor’s plan is devoted to dismissing storm surge barriers for New York City. Cost? The Mayor’s plan estimates the cost of barriers as $20 to $30 billion. By comparison, the City’s proposed Phase 1 is estimated at $20 billion, with more to come. The cost of Sandy to New York City alone is estimated at $19 billion. By the 2050s, a Sandy would cost the city $50 billion, according to the Mayor. Social justice? The barriers would create an “insiders/outsiders dynamic,” according to the Mayor’s plan, where those behind the barriers would receive maximum protection, and others would be left out. But apparently the Mayor ‘s fragmented plan , where neighborhoods judged to be vulnerable are given local protection at the expense of nearby neighborhoods, would not. Hydrodynamic and environmental impacts? Well, they haven’t prevented other cities from being protected, but all the more reason to begin to evaluate what these impacts may be and how they may be ameliorated. Safety? Although none of the several other barriers elsewhere has ever failed, in some cases for half a century, it is feared that their failure in New York would lead to catastrophic flooding. But no surprises. Better, it would seem, for New York City just to plan to be flooded. Douglas Hill, EngScD, P.E., F.ASCE is a consulting engineer and adjunct lecturer at the School of Marine and Atmospheric Sciences at Stony Brook University. Address: 15 Anthony Court, Huntington, NY 11743. 631-421-5544 dhill19@optonline.net or Douglas.Hill@StonyBrook.edu. Political and scientific leaders recently made their own waves as they debated plans for post-Sandy protection aboard a luxury yacht touring New York Harbor. Professional opinions differed between a representative of the mayor's office and a leading engineer who took the floor on the top deck of the Zephyr, which left South Street Seaport in Manhattan on a two-hour trip sponsored by the Working Harbor Committee that included much of Staten Island's North and West shores. The tour was called "Beyond Sandy," and for paying customers, it brought together top minds to debate the best ways the city can brace itself for future storms. Integrating that into the boardwalk would provide protection for a large portion of the East Shore of Staten Island. The Army Corps has actually been looking at that project since the 1990s. That project needs to be moved forward. When the Army Corps is involved, there is a lot of process involved, and sometimes that can delay projects that, even if people think there is a lot of sense behind it, there may be a lot of issues that will stall it. That would improve conditions and it would help improve the vulnerability to smaller storms.But my thesis is that those types of measures, while they are helpful, don't really address the long term problems that we are facing. The 100-year storm now has to be considered a much more frequent storm. The 10-year storm becomes the three-year storm, and so on. Abrahams introduced to the audience on the Zephyr his plan to install three floodgates in major city waterways. The gates would be similar to those constructed in London and those proposed for cities like Saint Petersburg, Russia, and Venice, Italy, designed to protect coastal cities from surges and wave action caused by storms Sandy-sized and above. Located in the East River, the Kill van Kull and either the Arthur Kill or the waters off Sandy Hook, N.J., the gates would protect New York City in ways the mayor's plan could not, Abrahams said. Buts the project's projected price tag of around $20 billion that makes its completion improbable. It is definitely not something to forget about. The city decided to forget about it, right? Abrahams believes there are multiple reasons why this is. For one, there is environmental concern that the massive water gates -- which would need to protrude more than 20 feet out of the water -- would negatively affect water flow and marine life. There is also the ignorance that stems from the uninformed belief that New York cannot suffer from another Sandy, he said. "It is really hard for people to grab onto the idea that we can get hit again," he said. In fact $20 billion is not a large amount of money for this. We've already spent that much on Hurricane Sandy. If you look worldwide and see what other major cities are doing, then maybe a different solution will appear more acceptable. Haas said the gate option will be further investigated, but advocates the mayor's plan for its wide-ranging intentions. The layered approach really looks at protecting the coastal edges, while also looking at building level protections and infrastructure protections. In lieu of one large, mega-project, a number of interventions and improvements that protect neighborhood-wide, area-wide, can really improve conditions. It's nearly impossible to climate-proof New York City. Somehow, Mother Nature is going to bring something that is beyond what was anticipated. L to R: John Tepper Marlin, Helen Keller, Henry Etzkowitz. 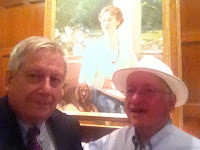 Last month I met with my friend Henry Etzkowitz for breakfast. There he is with the hat in the photo at left. I am taking the picture (a "selfie") with my right hand. Behind us is a portrait of Helen Keller that reminds me of the thought, “None so blind as cannot see,” an idea dating back before Oedipus to Jeremiah 5:21. On the appropriate policies for encouraging technology, Etzkowitz is my guru. He travels around the country and the world picking up honors for his documentation of policy successes, and I update him on recent developments in NY State and NY City, the most interesting of which is the Cornell-Technion Center on Roosevelt Island. Over the last two decades we have often shaken our heads together at the failures of NYC policy-making to encourage technology as an engine of local economic development. Our shared interest in tech policy goes back to the 1990s when I was serving as chief economist for the second of the three NY City Comptrollers, between 1992 and 2006. The chief economist function was created by new responsibilities conferred by the 1990 NYC Charter Revision on the Office of the NY City Comptroller. The City Comptroller's office has been included in economic-development planning - for example, in a 1995 conference organized by the President of the Federal Reserve Bank of New York, Bill McDonough. The NY Fed called together leading institutions in the region to explore New York’s potential for transition to a knowledge economy, imitating the initiative taken before and after World War II by the Federal Reserve Bank of Boston, and leading to the expansion of tech startups along Route 128. The Lower Manhattan Association provided administrative support for the NY Fed’s conference, and a young science-policy graduate, Michael Salvato, worked on the program. Etzkowitz was a key participant, as the then-director of SUNY’s Science Policy Institute. Magnificent it was, but not sustained. Few participating institutions signed up for the follow-up phase. Contrast this with the New England Council, a decades-long effort from the 1920s that sought to follow the model that led to Silicon Valley, by systematizing the high-tech spinning-off fostered at Harvard and MIT. The New England Council sustained its effort first in scientific instruments at the turn of the 20th century, then in radio in the 1920s. Their work helped create Small Business Investment Companies and the entire venture capital industry after World War II. When I was at the Small Business Administration in the 1960s, I was able to study at close quarters the successes of the SBIC program. The American Research and Development Corporation was founded in 1946 as a pro bono regional development effort. A decade later it founded the Digital Equipment Projects, which was intended to create better aircraft training simulators but engineered the mini-computer along the way. Why Did the NYC Regional Effort Fail? So why was the effort not sustained in New York City, in contrast to the Bay Area and Route 128? Silicon Alley was considered to be doing okay by itself and the involvement of government and universities wasn't seen as necessary. NYC software firms that were competing with the Bay Area and Route 128 by supporting Wall Street's highly proprietary electronification projects did not see any value in regional cooperation. Some knowledgable tech people felt that NYC was too far behind Stanford and MIT both on the entrepreneurial front and in the sophistication of its programming to begin to compete. In this environment, the NYC Comptroller’s Office published a report, under my direction, on the “NYC Software/IT Industry” in April 1999 (summary and links to pdf files here). The NY Times covered it well, including with its summary of the report a photo of the Comptroller. The Chancellor of CUNY, Professor Harry Markowitz, told the Comptroller he loved the report. The Comptroller was pleased and generously said so. Etzkowitz played a key role in helping us define the history of tech policy and an appropriate path forward for NYC, as reflected in the last few chapters of the report. A public-school system that provides a steady supply of well-trained high school graduates who are ready to grapple with technology issues at the university level. Close cooperation among regional universities, private and state-run (and definitely including community colleges), to ensure strong support for entrepreneurs seeking high-quality technical staff. Centers of technology excellence among the universities, especially schools of engineering, and supportive faculty at business and law schools. Training for technology experts in tech transfer and entrepreneurship. University-based incubator labs and university support for policies that reward labs and centers and individuals within them for innovation. Business interest in, and support for, bringing university-based ideas to market in a collaborative environment. Government support for technology to encourage university-business cooperation. The big missing tooth in this dazzling smile was the entrepreneurial skills created by the open communication between universities and business in Silicon Valley and Cambridge, Mass. NYU and Columbia around that time announced they were going to work more closely together on research and technology initiatives. However, in fact technology took a back seat after the sharp drop in dot-com share values in spring and fall 2000. The NY Academy of Sciences won a million-dollar grant from the STARR foundation, but the large universities were not impressed and most of the funds went to support publications drawing attention to the tech assets of the region. A seminar series drew second-tier administrators and junior faculty, with the notable exception of the President of New York Poly in Brooklyn. One practical result was the creation of a network of area university technology officers who spun off their own support network. After 9/11, and the election of a mayor who had made his fortune by selling technology services in the form of Bloomberg machines, Etzkowitz and I expected the new mayor to lead a major tech initiative that would make the City of New York into a tech center that might eclipse both Silicon Valley and Route 128. We were disappointed. The new mayor made clear he was a businessman first and techie second, and he did not undertake any major tech initiatives in his first two terms. He made up for that in his third term with the competition that led to the Cornell-Technion project, but if he had stuck to the term limits in City Charter he would not have left much of a tech legacy. For the ten years after the Comptroller's Software Report, Etzkowitz and did what we could to keep the recommendations of the software report in front of people who might implement them. Etzkowitz organized the NY Inter-University Seminar on Innovation, bringing researchers and practitioners together from across the region. We had monthly meetings with guest speakers who discussed the recommendations for inter-university cooperation for technology development. We deliberately did not meet at universities, but mostly in the Comptroller’s Office and sometimes the conference rooms of law and business offices. In 2001 I wrote to the Mayor about creating a technology-transfer office comparable to the Mayor’s film and broadcasting office. In 2002 I met with Deputy Mayor Dan Doctoroff on the subject. Etzkowitz also tried to get some interest from the new Mayor. While the NYC Economic Development Corporation did some good things to assist firms involved in the knowledge economy, their focus was largely on matching up available real estate with business needs. They took action when real estate opportunities meshed with tech promotion. In 2012, as the Cornell-Technion Roosevelt Island initiative took shape, Etzkowitz and I felt that our thesis of the missing link in NYC’s innovation ecosystem — a Stanford-MIT-like institution focusing on commercializing knowledge, tech transfer and incubation, as well as basic research and education - had found a place on NYC’s policy agenda. In retrospect, it looks as though to get the interest of Deputy Mayor Dan Doctoroff we should have translated the Software Report recommendations into a real estate-driven project. When I met with Doctoroff I should have come in with a plan not just for policy but for leveraging $100 million in vacant city land and municipal bonding to attract 20 times that in university and business investment. Mayor Bloomberg’s Roosevelt Island project is now focusing on master’s-level students. But research groups require a variety of skills and levels of involvement, including Ph.D. students, post-doctoral fellows, teaching faculty, research associates and undergraduates, supported by large-scale research funding, typically from the federal government, with state government and industry support at the margin. I remember attending a meeting of MIT alumni in NYC, when Mayor Bloomberg had just published his book and was contemplating a run for Mayor to succeed Giuliani. He emphasized how competition keeps everyone on their toes. Afterwards I spoke with an MIT professor who said that NYC would never catch up to Route 128 because it didn't have the entrepreneurial spirit. Etzkowitz thinks this is still a problem: "NYC still needs an MIT-type institution, along with a system of mentoring research groups to generate spinoffs. Entrepreneurship is a group activity." NYU has a big data analysis center focused on urban issues, building upon its mathematical strengths and industry links. Columbia is breaking its geographical boundaries, expanding its technology projects above 120th street and linking with City College, in a joint biomedical/engineering research center, building on the strengths of these two schools. NYC also has special assets. The SUNY Fashion Institute of Technology spins out boutique fashion firms, continuing the Institute’s role of bringing together industry and labor to helped the garment industry grow into the fashion industry. Similarly, the SUNY at Purchase theater and dance schools operate on an implicit incubator model, graduating theater and dance troupes into NYC’s thriving cultural economy. A key to the future is how state governments are responding to their revenue challenges. Etzkowitz thinks that underfunding of schools in California since Proposition 13 and cutbacks in support of the University of California may damage the Bay Area franchise. Massachusetts, meanwhile, is going in the other direction, funding its public schools and universities.